No. 2 Florida Gators basketball (23-2, 12-0 SEC) takes a break from its long road stretch with a home game Wednesday against the Auburn Tigers (12-11, 4-8 SEC). Before the first practice of the week, Florida head coach Billy Donovan met with the media to discuss the upcoming contest and difficult road ahead. Hill’s absence means senior PG Scottie Wilbekin will see an extended stay on the court, but the Gators will also need others to handle the ball when Wilbekin does take a seat. Donovan plans to go with a committee of redshirt sophomore forward Dorian Finney-Smith, sophomore guard Michael Frazier II and sophomore G/F DeVon Walker, all of whom handled the ball earlier this season when both Wilbekin and Hill missed games. Donovan also noted that neither DeVon Walker nor freshman F Chris Walker were injured on Saturday but neither saw much action (seven minutes combined) due to a variety of factors including Florida’s frontcourt not being in foul trouble and the seniors not getting winded during the second half. Though Wilbekin was named SEC Player of the Week on Monday, senior center Patric Young has been just as integral of a piece for the Gators over the last week, stepping up with some huge plays against Tennessee and a great second-half offensive performance on Saturday at Kentucky. Asked to evaluate where Young has made the biggest improvement this season, Donovan noted that his consistent work ethic has really made a difference in his game on a day-to-day basis. “I think Patric has been one of those guys, through his career, where he’s had a good game and inevitably, he would come back feeling very, very good about himself and sometimes unwilling to kind of go back down to the cellar and prepare again,” he said. “I think a lot of times for young players, it’s always easier to prepare when things don’t go well because you want to get back and redeem yourself. When things are going well, you have the tendency to say, ‘OK, everything is OK, everything can stay as it is,’ and the reality is that it’s not going to stay how it is. You have to go back down. We all know how fine a coach Billy is . Sounds like he’ll keep them grounded game by game !! 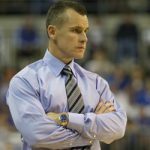 We are very lucky to have Billy Donovan. Basketball is fun again! Post season conference awards should look like this: Billy – COY, Wilbekin – POY, Finney-Smith – 6th man of the year, Wilbekin & Prather – All-SEC 1st team, Young – All-SEC 2nd team. With all the hype Kentucky & Coach Cal get every year, the record will show the Gators have won as many or more games in 4 of the last 6 years. 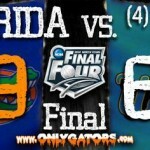 Go Gators!! !